In 1941, eight-year-old Michala Cloonan Miller found herself a very small player in the infinitely larger drama of a world war. Raised in the North Park, Colorado, town of Walden, population 600, Miller was thousands of miles from the European or Pacific theaters. Nevertheless, the war touched her childhood daily. In this gem of a book, finely illustrated with pencil drawings by Jean Kashner, Miller recalls with dry humor, irony and exquisite detail the excitement of War Chest campaigns, victory dances, tin collections and patriotic school programs. She credits her childhood of sacrifices and shortages with molding the woman she is today. 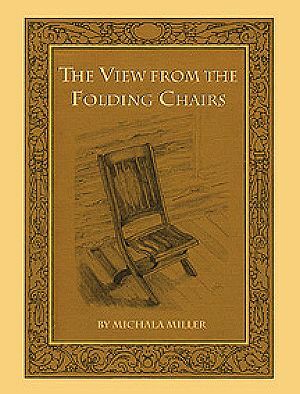 Miller sets the reader down in the folding chairs on the front porch of her family’s rented summer house, where she and her sister soak up her mother’s stories, learn to play cards and follow the progress of war campaigns on a large wall map. The View From the Folding Chairs transports the reader to a time marked by fall canning, freshly made baked goods, darned socks, borrowed and patched clothes, chickens in the yard, outhouses and evenings spent reading by the light of kerosene lamps. From collecting gum foil wrappers to “hammering the last ooze from the toothpaste tube,” Miller captures every sweet and touching detail of this era which has been made more distant by the speed of modern life. Michala Miller is the granddaughter of Irish immigrants who in 1878 settled in Leadville. She was raised and married in North Park. Today, she resides with her geologist husband in Steamboat Springs, where she recently retired from a career as a bailiff with the Routt County Court system. She spent fifteen years writing The View From the Folding Chairs. Jean Kashner has sketched since childhood. She earned an associate’s degree in commercial art from El Paso County Community College and has frequently exhibited her work in northwest Colorado. She makes her home in Hayden with her husband and four cats.